Mike Maguire, 53, started swimming with Water World Swim in 2014. 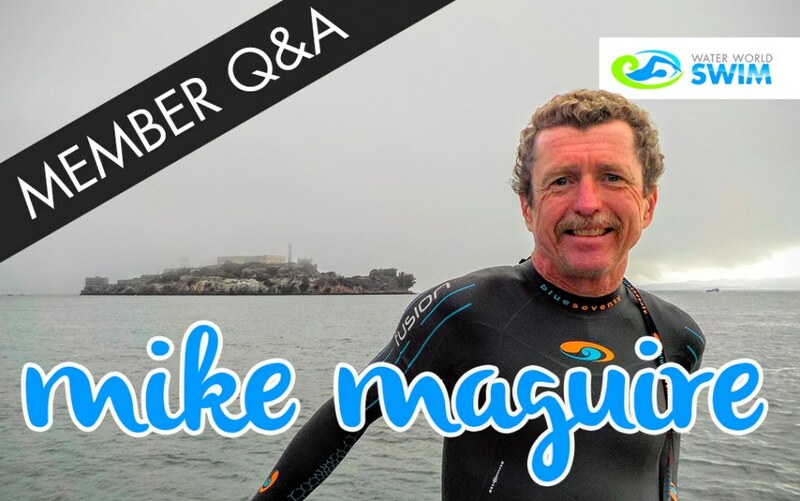 He has been a swimmer for only 4 years, yet has completed three Alcatraz crossings and won his age division in several triathlons. After recently suffering a broken collarbone, broken shoulder blade, and severely bruised leg in a bicycle crash, he went on to qualify for Team USA Triathlon for the 2017 Age Division Duathlon Standard Distance. 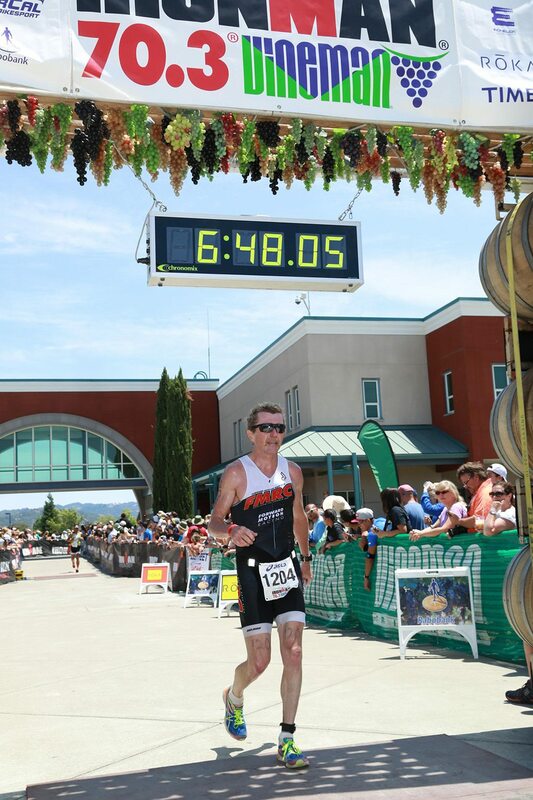 He is also a past participant in other Team USA events: the 2015 Age Division Triathlon Olympic Distance National Championship (personal best) and 2016 Age Division Duathlon Standard Distance National Championship. How did you get started in open water swimming? I started open water swimming in 2014 when I started participating in triathlon events for the first time. I had been learning to swim in a pool starting in 2012, but had not really advanced in the sport enough until 2014. Pacific Grove Triathlon. I have now participated in that race 3 consecutive years. What makes it your fave? Several reasons. First, I love the Monterey Peninsula, an area my wife and I have visited many times the past 25 years. Second, it was my first ever Olympic distance triathlon and I was not sure how the swim was going to go, having swam the distance in the pool non-stop only once, and having done only 1 triathlon up to that point! Third, the course is stunningly beautiful. Fourth, it's a well run event. However, I may change my mind as I do more events in the coming years. What is the hardest swim you have done? The Del Valle swim festival 5K in 2015. I had never swam over 2 miles going in, and the warm Livermore weather that day made it very difficult to complete. What is your motivation for doing triathlon? Actually, I'm very new to triathlons, approximately 2 years. I have a long history of endurance running, having completed 17 marathons with a personal best time of 2 hours 36 minutes. My main motivation is my passion for training and competing. Training for triathlons allows me to cross train between the 3 activities (swim, bike, run), and thereby allow my body to recover more easily from specific workouts. The overarching motivation is the love of competition. Triathlons adds an entirely new dimension to it that I had never experienced in running. Triathlons also feel entirely new to me after many years of exclusively running only events, which is a big motivating factor. What draws you to the open water? I prefer open water swimming to pool swimming in that I can just set my sights on a point to swim to instead of the repetitiveness of pool swimming. To me, is a very direct parallel to running on the track vs. running on trails, the latter of which I've always preferred. Also, I prefer distance vs short intervals which open water swimming is like compared to the pool. What goes through your mind when doing an Alcatraz crossing? At the beginning, what have I gotten myself into! In the middle, just relax and enjoy the view while being aware of where the other swimmers are. Towards the end, bear down and finish. After finishing, a nice feeling of accomplishment. Do you have any swim training advice for age-group triathletes? I would recommend a balance between distance in open water once a week, and interval work in the pool 2-3 more days. I typically do 3 days that include at least one open water swim so I can still train at the other activities (run-bike). I would make the open water swim as long as possible in order to allow my body to get accustomed to some amount of fatigue in open water, or being able to push through the fatigue. Let’s talk about your bike crash. What happened? How did you manage to get back to training after that? I was 30 miles into a 40-mile bike ride in December just before the Christmas holidays out in the Livermore area. I was still feeling the effects of a cold, which may have distracted me just enough. I inadvertently hit a bump in the road and lost control of the handle bars. There were no cars involved. Before I knew it I was on the ground and stunned, not sure if I was hurt or how bad. A passerby who saw the crash offered to take me to the hospital, but I refused and continued to ride home - likely a mistake. When I got home, I looked at the shoulder in the mirror, saw a bump in the middle of my right collarbone, and immediately drove myself to the hospital. While there, I noticed I also had a lot of pain in my left hamstring which made it very difficult to sit. I didn't know it at the time, but I had likely partially torn my hamstring. I had a bruise that lasted for 2 months that looked like like a tear. The doctors diagnosed the bone break, but not the hamstring, which they thought was just a bruise. It was hard to walk for about 4 weeks. What I found out I could do immediately (two days after the crash) is ride the stationary bike at my club/gym with no pain, so I did that every day for 5 weeks, 70 minutes each workout! After that, I started mixing in some easy swimming starting in the pool, then back to open water after about 7 weeks following the crash. I also started some strength training for my legs and core after about 6 weeks. All of this helped me transition back to a normal training routine after about 10 weeks following the crash. I also had some physical therapy that did help. My first bike ride outdoors was 12 weeks after the crash. My first run was 5 weeks after the crash and it was very difficult, mainly due to the weakness of the leg. It has gotten much better, but it's still a little bit of a struggle. Of the 3 activities, the swimming was the easiest to return to with cycling second. Hopefully, no more crashes like this one. Immediately, I will be doing the Tri-California San Francisco Triathlon at Alcatraz in August. 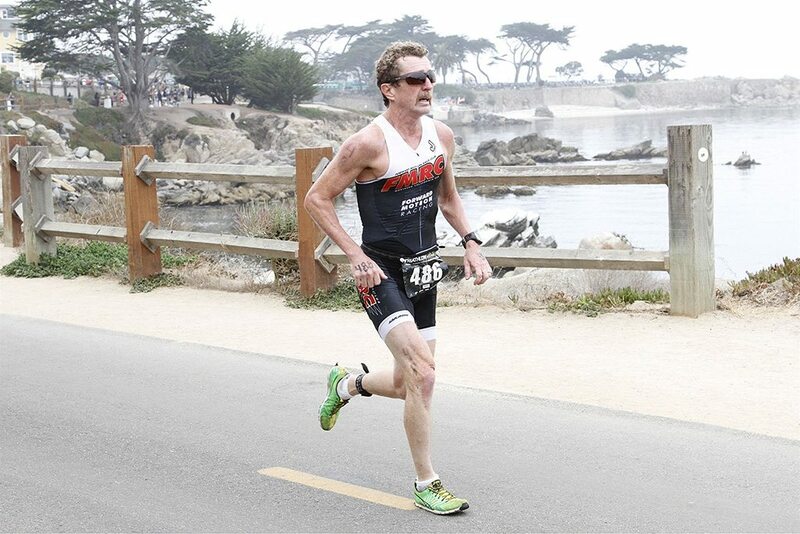 Then I will be doing my 2nd ever half IronMan in Santa Cruz in September. 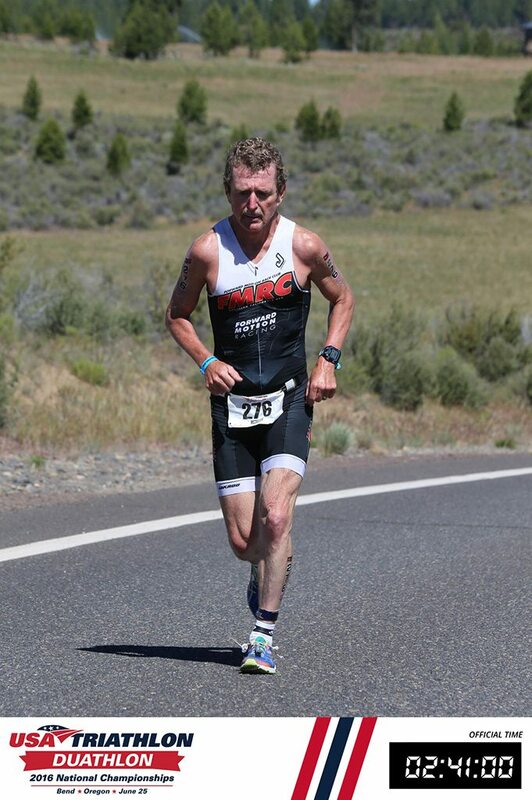 In 2017, I will be going back to Bend, Oregon to participate in the Duathlon Age Division National Championship again. In August 2017, I will be participating in the ICU World Duathlon Standard Distance championship in Penticton, Canada as a member of Team USA. Long term, my goal is to make it to a world triathlon championship, either the Olympic distance or half IronMan. I enjoy coming out every Sunday to swim with Water World Swim. It's a wonderful team that WWS has assembled. It makes going out there every Sunday so much fun, especially with all the other swimmers who make it to the workout. Someday maybe I'll do one of the trips. Maybe Greece. 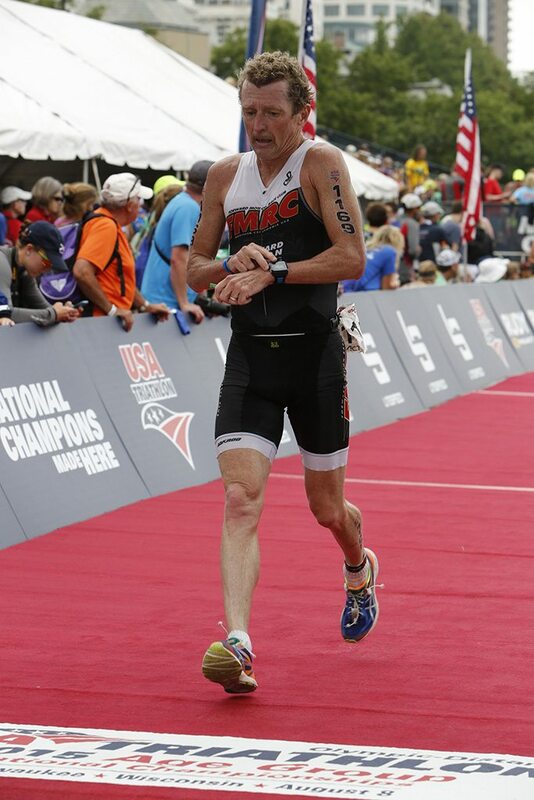 Check out Mike's triathlon and duathlon results online by searching for Michael Maguire, USAT (Age 54) here!